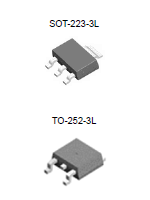 The TJ1119 series of high performance ultra low-dropout linear regulators operates from 2.5V to 5.5V input supply and provides ultra low-dropout voltage, high output current with low ground current. Wide range of preset output voltage options are available. These ultra low dropout linear regulators respond fast to step changes in load which makes them suitable for low voltage microprocessor applications. The TJ1119 is developed on a CMOS process technology which allows low quiescent current operation independent of output load current. This CMOS process also allows the TJ1119 to operate under extremely low dropout conditions.